In a simple grey pullover and a bright striped long-sleeved shirt, Dara’s animated facial expressions and wide smile draw people in. She rests her arms on the pitted, grainy wooden table, leaning in as if trying to capture every word. She isn’t young — her only daughter is already in high school — but she is tall and timelessly beautiful like a model, her blonde hair landing choppily on her angular shoulders and her pale blue eyes widening with interest. Her laugh is honest and real. Pure, unadulterated joy seems to seep from her very pores. Despite all odds, Dara is simply happy to be alive, but it has not been easy. For Dara, a Palo Alto resident whose name has been changed to protect her identity, the challenges of affording rent and putting food on the table has made her life a constant struggle. Home to tech giants like Facebook, Google and Survey Monkey, the Bay Area is considered the heart of the tech industry. With the gap between millionaire tech barons and conventional jobholders constantly expanding, the Bay Area is becoming increasingly defined by its overwhelming wealth and wealth disparities. According to a study recently published by The Brookings Institution, the gap between the rich and poor in San Francisco is growing faster than any other city in the nation. While Silicon Valley reaps the benefits of the tech industry, Palo Alto continues to suffer from housing prices that force many low-income families out of the area. Even though Palo Alto pays $3.75 above the federal minimum wage, according to City Council Member Eric Filseth, Palo Alto’s $11 per hour minimum wage cannot cover the costs of housing within a 15-mile radius of Palo Alto. The result is that those in the service industry cannot afford to live near their workplace. “Minimum wage really hasn’t kept up with inflation,” City Council member Tom Dubois, a staunch supporter of raising the minimum wage says. Palo Alto plans to raise the minimum wage to $15 by 2018. “Every city is having these issues Palo Alto is having,” Dubois says. Palo Alto has an especially competitive market because of a multitude of desirable amenities: a huge job market, Stanford University and a high-ranking school district. According to Filseth, one of the many reasons Palo Alto has become more expensive is because the housing demand is higher than the supply. Housing costs show no sign of plateauing with demand pushing costs to all time highs. “For what it’s worth — it’s always been expensive to live here. I graduated from college 35 years ago and certainly couldn’t afford Palo Alto,” Filseth says. Despite the national annual income of $50,000, many people in the Bay Area on the brink of homelessness struggle to live on $20,000 or less, a fraction of the state estimated $82,000 yearly living cost for this area. Fortunately, organizations like the Second Harvest Food Bank support people who are living on $20,000-$50,000 in Santa Clara County. According to Innvision Shelter Network, an organization dedicated to helping the homeless find permanent housing, a one-bedroom apartment in Palo Alto costs $2,595. Second Harvest Food Bank found that housing prices in Santa Clara have risen 12 percent in the last year, and it takes more than $82,000 per year for a family of four to reside in Santa Clara County. Historically, the most affordable place to live near Palo Alto was East Palo Alto, but as prices continue to rise, the only option available is the East Bay. Dara has lived in the same one-bedroom apartment with her daughter for the last 11 years. She had only one official rent hike: from around $1,075 to $1,125 — before old landlords put her apartment on the market. Her problems began last fall when her job as an art teacher at an alternative private school ended. This coincided with her apartment complex being sold. “It was really shattering for me because that was my bread and butter, because they [the private school] paid a better rate,” Dara says. At that point, all the school schedules had been set at other schools, which meant Dara had no way of finding another teaching job during that school year. “The previous landlord understood my situation, he knew that my daughter had been in Palo Alto Unified School District since kindergarten and told me that they would not raise the rent until she graduated high school,” Dara says. When her former landlords put the house on the market, they raised the rent from $1,125 to $1,350, putting stress on Dara’s limited budget. Dara and her daughter were living on a month to month lease, and when the apartment was sold, they weren’t protected from the rent hikes by the new owners: $1,475, and then four months later to $2,100. Dara suddenly couldn’t afford the rent because of her financial constraints. One of Dara’s biggest priorities was and still is finding a way to let her daughter stay in the same school district. Over the course of her childhood, Dara herself attended 16 different schools. Dara was forced to seek other options. She took her ex-husband to court to raise the amount of child support she received. She also started receiving food stamps, emergency cash aid and even tried downsizing from her already tiny apartment to shared housing. Unfortunately, every search for an apartment came up with even more disappointing results. Prices seemed to be going up even higher, leaving Dara and her daughter with even fewer options. Luckily for Dara, she has since found a stable job and her rent has decreased. The new owners of her apartment who had raised the price to $2,100 agreed to lower it to $1,900 when she signed a one-year lease. However, this isn’t a permanent solution — $1,900 is still too expensive. 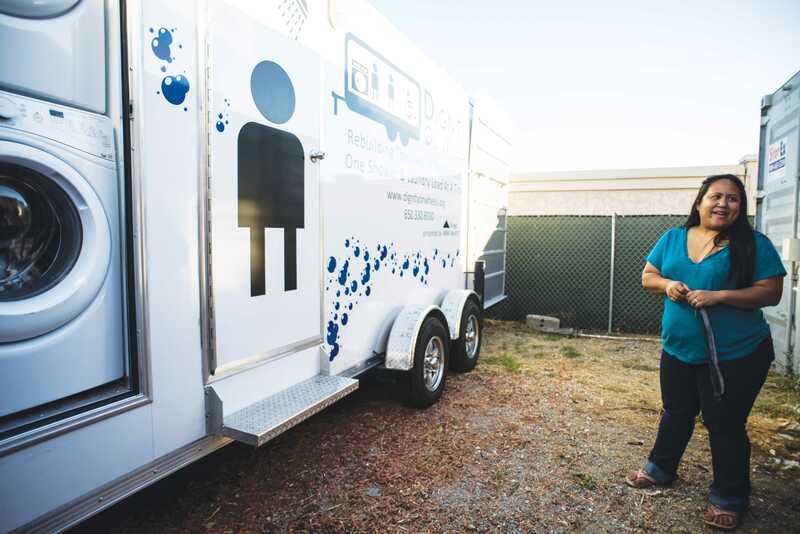 WeHope (Dignity on Wheels) marketing manager Cynthia Corpuz stands next to the shower bus that goes to different locations in the Bay Area to provide homeless people with free shower and laundry services. As housing prices increase, more and more residents are being forced to turn to low-income programs such as homeless shelters and food stamps. According to Adam Klein of InnVision Shelter Network, many of the long-term residents that being are priced out of their apartments are retired senior citizens who have little in the way of increasing their annual income. To help support low-income families, Second Harvest Food Bank is hoping to raise $15 million and collect two million pounds of food, but the non-profit’s CEO Kathy Jackson worries that they will not be able to meet these goals. The food collected from donations, manufacturers, farmers, retailers and the government is distributed through the 330 non-profit partners of Second Harvest to those in need. However, they have only met half of the $15 million fundraising goal for the holiday season. Other organizations are making efforts to provide people with fundamental resources needed to live independently. Dignity on Wheels, run by the non-profit Project We Help Other People Excel (Project WeHope), provides homeless people with a “shower bus” which visits various sites in the Bay Area and allows people to shower and do laundry. The goal of service is to help serve those who might not normally seek out such services. Despite only having one bus, Dignity on Wheels serves a number of sites, but they hope to expand to homeless encampments and provide people there with caseworkers and medical attention from registered nurses. Corpuz agrees that if prices continue to increase, the demand for low-income programs will only go up. Palo Alto is making efforts make adjustments to meet the needs of the area. In addition to raising the minimum wage, Palo Alto has also placed caps on how large an office space can be to prevent corporate expansion into possible living spaces.